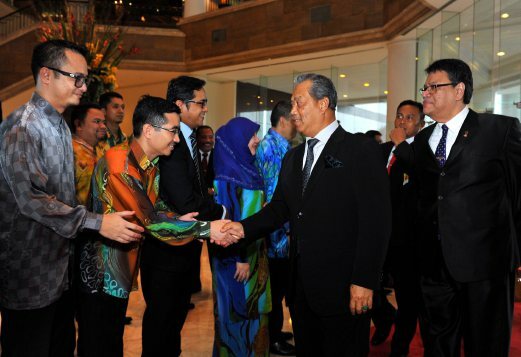 JAKARTA: Deputy Prime Minister Tan Sri Muhyiddin Yassin has arrived here tonight to begin a three-day working visit to the Indonesian capital. Accompanied by several government officials, the entourage was greeted upon arrival by Malaysian Ambassador to Indonesia Datuk Seri Zahrain Mohamed Hashim at the Halim Perdanakusuma International Airport. The deputy prime minister and his entourage will later have dinner with some 400 Malaysians at the Grand Hyatt Jakarta. Muhyiddin's programme tomorrow begins with a breakfast meeting with Indonesia's education and culture minister Anies Rasyid Baswedan and research, technology and higher education minister Muhammad Nasir. Later, Muhyiddin is scheduled to make a courtesy call on his Indonesian counterpart, vice-president Jusuf Kalla, where they are expected to discuss maritime boundary issues and cooperation on enforcement against the threat of extremists, in particular, the Islamic State or IS.